Description: 41T was ususally a mid day train on the Tier, but occasionally it would get out of its slot. Todays effort is one of those, rolling through Owego into the susnet with trackside goldenrod providing a splash of color. Description: 41T rolls through an area that has seen many changes over the years. The DLW main once ran to the left of this line, now just a memory. That's NY17/I86 in the background. Taken fom the NY 352 overpass, which was once NY 17 before the 4 lane was built. 41T rolls west on the ex Erie with 78 cars. Description: 41T rolls 78 cars along the icy Susquehanna as it makes its way toward Owego and ultimately Toronto via CN. Description: 41T rolls past a cornfield near Smithboro, the golden stubble rising through the snow making an attractive contrast. Description: 41T rolls past a wintry looking cornfield a few miles east of Waverly. There was once a barn and silo at far left-you can see what it looked like in some of the photos from Conrail from Endicott to Gang Mills. Now its just a heap of used beams. Description: At Waverly, the Susquehanna turn south to Pennsylvania, and the railroad picks up the Chemung River valley, which it will follow to Corning. Were looking from NY 427 a few miles east of Wellsburg as 41T rolls along through the snow in a panormic shot. Description: Westbound aproaching Matsqui Via Rail "hut". Description: CNs big guns down at New Brighton this morning. Description: A CN mixed freight led by SD75I #5575 aproaches Broad Street from the west on the EJ&E mainline. Description: Snow falls as local and A431 power sit in the yard. Title: CN 5755 conversing with the orange goon. 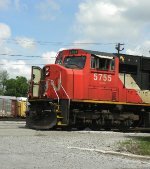 Title: CN 435 at Woodstock.